Maersk Line announced that the company has restarted its shipping operations to the Republic of Maldives on the heels of rapidly growing market and meeting customer needs. The initiative also aims to provide a strategic trade opportunity to all the Countries in South Asia. “Maldives has a flourishing tourism market and offers an excellent opportunity for global trade. Interestingly, around 90 per cent of Maldives trade is import driven and spearheaded by China, India and Sri Lanka. We believe that the weekly feeder service between Colombo, Sri Lanka and Male, Maldives will facilitate better trade in the region. 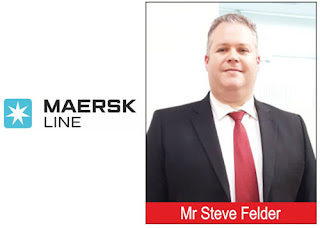 Besides, we are now equipped with better control and processes to handle these locations and thus will prove to be a reliable, convenient and time-saving service”, said Mr. Steve Felder, Maersk Line Managing Director for India, Sri Lanka, Bangladesh, Nepal, Bhutan and Maldives. Maersk Line is the market leader on the trade lanes from China and India into Sri Lanka. The new service will offer customers access to the best-in-class network and better cargo connectivity with optimal transit time of 18-26 days. “China, India & Sri Lanka being main origins for Maldivian imports, exporters in these markets will benefit the most by having a reliable & trusted -partner in Maersk Line” he adds. The global containerised shipping company uses technology like Advanced Remote Container Management (RCM) that can track reefer containers as well as offers superior customer services like dedicated sales and customer service agents for a seamless shipment experience.